For many years, I’ve been immersed in reading and writing Queensland history – stories of its people, places and events. Much of Queensland history is about heart-breaking struggle, striving against the environment, the economy and the social forces trying to build an English-style hierarchy. Is it any surprise that as an antidote to those sometimes-harrowing true stories, my other reading love is romance, with its happily-ever-afters? I find it impossible to resist the urge to combine those two loves —to give HEAs to those determined men who came to Australia to make, if not their fortune, then a new life; and to those women who hoped for a more independent life here or just to support the menfolk of their family. 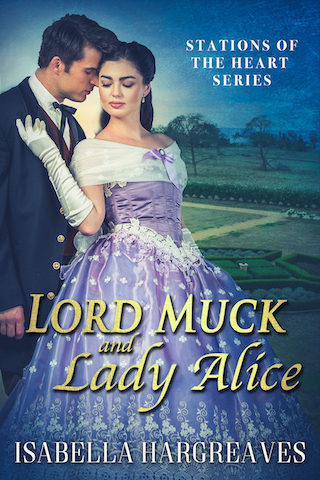 Today is the release day for Lord Muck and Lady Alice, the first instalment in my ‘Stations of the Heart’ series—a family saga set in rural Queensland between 1868 and 1879—which arose out of my love of Queensland history, and romance. Lord Muck and Lady Alice is set on Darling Downs, 1868. ‘Self-made man’, pastoralist and member of parliament, James Forrester, a disdained ‘Lord Muck’, must overcome his prejudice against the English aristocracy to pursue his love for Lady Alice, whose brother evicted James’s family from their farm in England. Let me show you photographs of the type of homesteads in which Darling Downs pastoralists lived during this period. The second book of the saga, Love and Other Addictions, is set in central Queensland in 1874. It focuses upon James’s younger cousin, the opportunistic pastoralist Robert Dysart, who wants control of the river-front property he was cheated out of ten years ago. Edith and her opium-addicted brother want to start a new life in Australia, away from the temptations of London. After her brother buys the property Robert wants to own, distrust and bitter conflict develop between Edith and Robert, destroying their early attraction, until Robert finds a way to prove to Edith that he desires her more than wealth and social standing. The third book of the saga, Finding Love at Lost Lagoons, tells the youngest cousin’s story. Lonely bachelor, Walter Jamieson, runs a struggling north Queensland pastoral station he wants to turn into a paying concern. His isolated life is shattered by the arrival of Elizabeth Chesterfield, a young woman determined to escape an arranged marriage being forced on her by her scheming brother. Widower James Forrester of Eldernell Station on the Darling Downs is a self-made man, a wealthy pastoralist and a member of parliament. He escaped from poverty after his family was thrown off their tenant farm in England by their local lord. Sneered at and called ‘Lord Muck’ by the Australian gentry, because of his lowly beginnings and lack of education, James is determined his only child, Nell, will fit into society; and requires needs an education fit for a lady. Lady Alice Lethbridge Arnley wants to escape her demanding siblings, who see her only as companion and nurse. Alice breaks free by arranging to work as governess to the children of her cousin, Mary, living on the Darling Downs in rural Australia. She vows never to use her title and connections in her new life. She arrives to find Mary has died and her husband, a wealthy pastoralist, has taken to drink to forget his grief. When he tries to seduce Alice, she flees his homestead in the middle of a thunderstorm. She is rescued by James Forrester and his daughter, and takes on the twin jobs of educating James’s shy daughter in every accomplishment needed to enter society; and of trying to polish his etiquette. What happens when James discovers the woman he loves is a member of the aristocracy he despises and of the family that impoverished his? Can Alice save the unrefined man she loves when the forces of colonial society are united to ruin him? Reblogged this on History in Focus. Great to be on AusRomToday. Thank you, J’aimee!